About 14 years ago I was diagnosed with plantar fasciitis. It all started with my feet KILLING me! Then my whole body started bothering me. I remember going to the doctor and the first thing they said when they saw my feet, is that I needed to have surgery-- on my bunions. Nope! My bunions were fine, it was my right heel that hurt... a LOT! First they gave me cortisone shots. The shots helped for a couple of weeks, so then I got another one; which, again only lasted a couple of weeks. Well, we couldn't keep this up. They still really didn't know what my problem was, so they said it was probably Fibromyalgia. I knew it was not, and that it had something to do with my feet, since that is where the pain had started. A few months before all this, my mom started having the same issues. She had gone to a doctor that diagnosed her with plantar fasciitis and put her in this weird brace to sleep in. It didn't work, and the only thing it did was give her cramps in her leg. After she had worn this brace for awhile, she had heard about Birkenstock shoes. In fact, my youngest sister wore them often. Mom gave them a try and has been wearing them ever since with minimal heel pain. Since they worked for her, I decided to give them a try, and I have also had minimal pain, until lately. It all started with a pain on the right side of my neck. I went from about half way up my neck and down my shoulder. I even had a little swelling over my collar bone. At first I didn't think much of it, thinking maybe I just slept wrong. After two weeks, I started to worry. The swelling was still there and so was the pain. I really hate going to the doctor, but after my last episode, I decided to go. As usually, the pain was poo pooed, and I was sent home. They did say to maybe try some physical therapy and wrote up some orders. I found that it was going to cost me $75 a week, and wasn't sure that was my answer so I did not go. About a week later, I remember my right foot really, REALLY hurting me; like I could hardly walk on it. Felt just like the plantar fasciitis I had years ago. Soon, my whole body was hurting. I hurt to lay in bed, it hurt to stand or sit. Every part of my body (except for my hair) HURT! So, back to the doctor. Again, I felt like an idiot. They checked my for fibromyalgia, and thankfully, that was not it. Then they took some blood work and told me the results should be back in a week. Fast forward a week, and all blood work negative. That's a good thing, but now what? I was told I was fine. So, if I'm fine, then why am I hurting. "I don't know" was the answer. I got really angry at the poor girl, said a few choice words (no R or X rated words), and hung up on her. I then left for the pool. That seems to be the only place lately that I feel little pain. So now what? I guess I could move my bed up to the pool, but not sure that would be the best idea. I'm going to give this another week, then see what my next step is, that is if I'm still in this pain. I feel like an old lady. When I first get out of bed or up from a sitting position for awhile, it really hurts! I really don't want to be on pain medication, as I don't do well on those...AT ALL! A few weeks ago, we did some yard work in the back. At first everything seemed, well, a little wimpy. Things have come along pretty nicely lately and the flowers and veggies are filling in beautifully. We have a pretty nice area in the back, but no tables. I had a bench, and four chairs. I bought cushions for them, and it sure made things look a lot more....homey. I've been wanting a table and chair set so we could actually eat out there without getting the plastic fold up tables out. Yesterday, as we were turning onto our street from a trip to Evansville, we noticed a garage sale sign. It was 9:30 at night, so we assumed it was for the next morning. I jokingly mentioned I should go check to see if they have any outdoor furniture. You see, I have been scooping out garage sales for YEARS trying to find a table. I do not want to buy a new table for what they are asking....at Walmart, a cheap outdoor table runs almost $200, and I don't even really like it that much. If I'm going to spend that kind of money on something, I want to like it. As I was contemplating what I should do, they came down, on both the sets, and pretty low, I might add; lower than if I had gone to Walmart and bought a new cheap table. So...I took them...both! Here is the wrought iron table and chairs. I will have to say, they have some weight to them, so even though I did not get my swim in this morning, I got a good workout moving furniture. I will have to replace the cushions soon though. I will probably choose green when I do replace them. Here is the teak set. I need to wash the tables and chairs off, but it was a bit warm. I will have to wait to do that tonight when it gets down to....80. What I like about this set, is that it all folds up, the chairs and table, so if we needed more room out there, I can fold these babies up and set it aside. Well, I'm glad I remembered the garage sale. Got what I've been wanting for awhile and didn't have to chuck out a hunk of money either. Now I just need to find some outdoor fabric on sale and get busy replacing those cushions. No Acer Computer For Me!!! We have been in search for a good computer; and one that has good customer service. My daughter had a Dell. Not three months after she got it, she started having BIG issues. We called customer service, on a daily basis for over a month, and they never could get that stupid thing to work. Eventually, she got a MAC. My youngest son got an Acer for Christmas last year. Yesterday, Ben opens his laptop and the screen is cracked...little boxes all over. He has less than a month of school left, and two of his classes are online...he NEEDS his computer. He took it to the computer doctor on campus and they had him order a screen and they will fix it for free. In the meantime, I did some research and called Acer (which was not an easy task). When I finally got someone, we had a language issue. Yes he speaks English, but not American English, so we had a bit of a problem understanding each other sometimes. He was very nice, but it would have been a lot easier if I could have spoken with an American. Once I finally got a hold of a live person, I found that yes, indeed, Ben's computer was still under warranty. But!!!! We had to send it to Texas. That is the only place in the U.S. that fixes Acer Computers. Then it would take 10 to 14 days to fix it and then they would have to send it back to my son. Guess what? School will be done before that time, so if he decided to go that route, Ben would fail all his classes and we would be out quite a bit of moola; even though they would fix the computer for free, except shipping to Texas. Why is it that these companies do this? If you sell a product, and have a computer fix it person in that store, you should have the certification to fix the item you sell in that store. I have a birthday coming up soon, and my husband wants to get me a computer. Right now, I use an old desk top that came over on the Mayflower...lol. Well, not quite, but I'm sure you get the picture. With me into photography and all, I need something a little more updated, but it won't be a Dell, and as I told the little guy over the phone, it won't be an Acer either. I was really looking into getting an Acer, but since it is such a hassle to get it fixed, nope, I'm not getting one. Glad I Was Running a Tad Bit Late Today! Lately, I seem to be in constant pain...all over. The only thing that does NOT hurt is my hair. So, I headed to the doctor yesterday. She took a bunch of blood, so hopefully I'll hear something by the end of the week. It will probably all come back negative, which is a good thing, I think. I would like something to come back positive, something that we can do something about, and get me back to my normal self. Although I hurt all over, I've been going to the YMCA five days a week. I've been swimming my mile and treading water for 30 minutes to an hour. Some days, in addition to that I take a water aerobics class or a water walking class. As long as I am in the water, I seem to not hurt so much. But as soon as I get out, uggg, especially my heel where I plantar fasciitis is. This morning, I decided I was going to go to Pilates. The other day I had gone to Yoga, and actually felt a little better for a few hours. Figured Pilates would be the same. I do stretch when I get out of bed each morning, and also I do some stretching through out the day, and afterward, I feel better, for a little while. So, I got myself out of bed, got ready and headed off to the Y. I don't really have time today to go to the pool, as I have somewhere to be later this morning. I was running a tad bit late, but that's ok, since the Pilates class is always late getting started. As I headed down the road, I see what looks to be a pretty bad accident. I am sure glad I was running late, as I probably would have been involved in that. It looked like a guy driving a pickup was trying to beat the light and turned too sharply, flipping the truck into the little white car in the left turn lane. It had just happened, and everyone was waiting for ambulance and police to arrive. I think everyone was ok, and the driver of the truck was trying to crawl out the passenger side. I sat there for a few minutes, and even talked to one of the people walking around. I asked if they had called 911, which they had, and made sure everyone was ok. Then I turned my little Scion XB around and went home. I went to yoga for the first time since I got out of the hospital two months ago. Boy, did I ever miss it. When I first got there, we were getting our mats out and everything ready for class. As we were doing all this we had an interesting visitor...the Hulk! 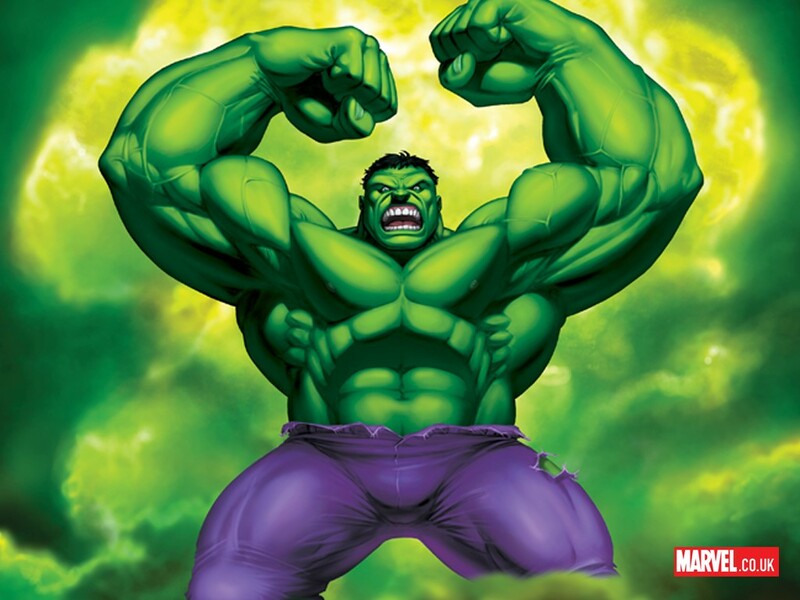 No not really, but if you painted his skin green, he sure could pass for the Hulk. So, Mr Hulk stood at the door for a few seconds. You could tell he was wanting the room. Finally he asked if there was a class. We told him yes, that there was a yoga class starting soon and that he was welcome to stay. He looked at us pretty funny and said that's fine, that he needed to work on his abs. My friend told him we worked on abs and he should stay. He left, and I didn't see it but I'm sure he left rolling his eyes. I'm not sure people realize how good yoga is for you. It is not an easy class. Yoga is good for everyone, young, old, people who are into athletics big time, and those just starting to move. Yoga is one of those classes that is for YOU. It is YOUR practice, not the person beside you, not your teacher, but YOU. As you progress in your practice, you will see improvement in your own class and lifestyle. My daughter is a yoga instructor and has actually taught athletes at their local university. I commend these coaches who see the benefit of yoga in their sport. Mr Hulk could not see that. All he saw was a bunch of old ladies sitting on the floor do a light workout. I would love to see him come in and try. I do believe that after our workout today, he would have a very different opinion of yoga, and if he did not come back, it wasn't because it was easy...it was because he found it more difficult than he thought. Just like the lady at our club that runs marathons. We have tried to get her to come workout in the pool and swim laps. She told us that you can't get a workout in the water, that running was much more of a work out than swimming. Well, I would like to see her come and prove that. I'm sure she would have a change of mind. I've known people who had the same attitude toward swimming laps, and when they came and tried, they were out of the pool by about lap five. Ok...before I begin, I want you to promise me you won't laugh too hard. You see, what I'm about to show you is pretty funny, and I have been laughing at myself about this. A few weeks ago, I started making these cute little critters. The first one I changed up a bit because I wanted to make a duck. The second one I made exactly like the instructions said, and came out with this cute little orange chick. I wanted to try to do a flamingo. You know I HAD to do a flamingo...Tappingflamingo? Anyway, he turned out big and, well flat. Yes...same instructions. Not sure what I am doing wrong to come out with such a diverse group of birds. I took them to the stitch club I go to each month, and the ladies loved them. Then I told them about my dilemma. We all had a good laugh. The only thing I can think, is that the first one I did with ZERO interruptions. Not so with the other three. Just over a year ago, we moved from Louisiana. This time last year, we were living with my in laws until we could get in our new house in Kentucky. 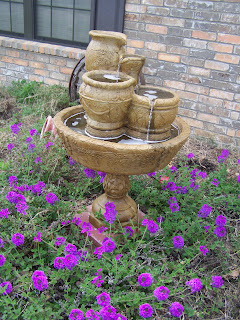 One of my favorite things about our front yard landscape in Louisiana was our fountain. It was one of the focal points in our front yard. I wasn't quite sure where I wanted to put it at our new home. There was already a fountain in front, besides there are a lot of pretty big bushes in the front, I thought the fountain would get lost. My husband decided to put in the back, that way we could enjoy the sound when we sat on the desk. The only problem was, it looked funny there all by itself. We left it there over the winter. This past April, my mom and I went to Disney with my sister and her family. While we were there, I was inspired by these planters they had all around Downtown Disney. 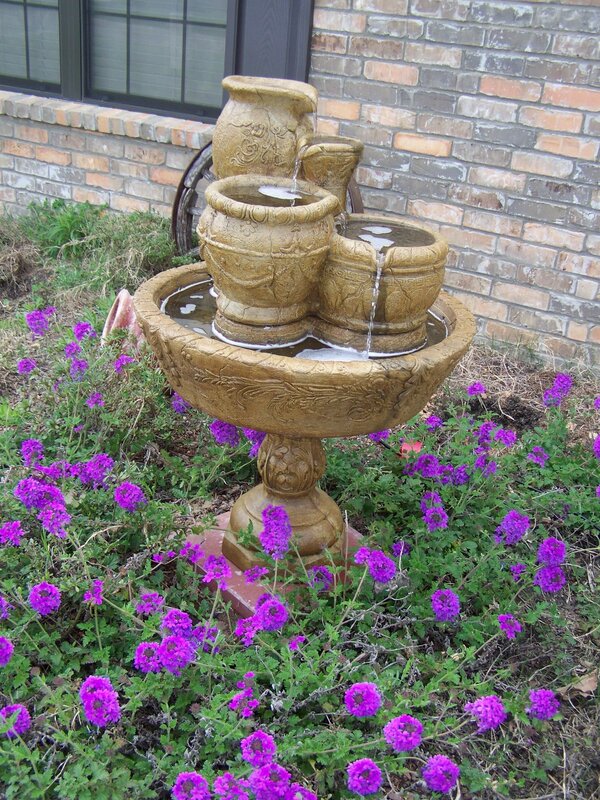 I thought it would look nice around our fountain. So a couple weeks ago, we gathered our pots that did not get broken during the move and started planting. As far as a choice in flowers, there was not much of a variety. At first I was a bit disappointed but as we started planting, I was fine with what we came home with. I love purple and yellow (no, I am NOT an LSU fan, I have always liked purple and yellow). We picked up a few herbs...Basil and Thyme. We found this Salvia on the half price shelf and decided to give it a try. It looks like it is going to make it. I can't wait to see the butterflies and hummingbirds it is suppose to attract. So far, this is what we have. It still needs a few more pots, but it is a start. I do believe once the flowers start filling in the pots more, it will look a lot nicer. We bought some Begonias, but after we planted them, we learned that they are poisonous to dogs. I moved them to where Sox cannot get to them. Next to the fountain area, we have some cucumbers that are beginning to grow. We also have some grape tomatoes and green peppers that are getting big. I think we should have planted the peppers somewhere else. Can't wait til we have some read tomatoes! Here are some more tomatoes. Not sure how these guys are going to do. We planted them here so the deer would not get to them. You see, we have a deer issue; as in about six to ten deer a day come through our yard. Hopefully, they will not come up on our deck and eat our plants. Someone very special is getting married soon, so I've been working on wedding jewelry. The bride has chosen pink and green for her colors, because her favorite color is pink and the grooms favorite color is green. Since they are getting married in August, and the birthstone for that month is peridot, she has chosen a lighter green. A few months ago, a friend of mine (who started making jewelry sometime ago), decided she wanted to focus more on quilting. She wanted to sell all her stuff and told me about it. There were all kinds of pretties, and I bought it all. Included in her many boxes of stuff were some really nice crystal hearts. She had one big deeper pink (which is pictured above and for the bride), three smaller hearts to match, three more that were a bit lighter, and three clear hearts. She also had a lot of pink crystal beads and a few peridot colored crystal beads. I had some freshwater pearls that I've been keeping aside for an occasion like this. Here is the bride's necklace up close. My friend also had some round, silver, clear crystal beads in her stash that I thought went perfect. Everything easily came together for this necklace, and I've started on the rest of the bridal party. I'm sure I will be showing them all when I get them done. Before ya'll start reading this blog, I want to apologize for the mess it is in. For some reason, Blogger is being crazy, and I can't seem to make it look the way I want, so please excuse the mess. Wow! Doesn't that make you want to get the amount of sleep you need? So, how much sleep do you need? Well, sleep varies as to who you are, and what you do. For example, are you a young adult or baby; do you have a stressful job, or is your lifestyle more laid back? There are many factors which determine how much sleep one needs. According to the National Sleep Foundation the following are the recommend amounts of sleep one needs each night. Which does NOT mean you can get a little sleep on some days/nights and then make it up all on the weekend. get my eight hours of sleep. suggested a couple of interesting things that I do believe will work. If you use an alarm clock to get you up in the morning, that is a telltale sign that you are not getting enough sleep. The fact that you rely on an alarm clock to wake you up every day shows that your body is not rested enough to wake naturally. A simple test you can use to determine if you’re getting enough sleep is to go to bed fifteen minutes earlier that you normally would. See if you still need an alarm clock to wake up. If you do, try going to bed another fifteen minutes earlier. Continue in this manner until you reach a point where you wake up naturally in the morning without an alarm clock. That’s how many hours of sleep you need each night. Even if you’ve enjoyed a full night’s sleep, getting out of bed can be difficult if your alarm goes off when you’re in the middle of deep sleep. If you want to make mornings less painful—or if you know you only have a limited time for sleep—try setting a wake-up time that’s a multiple of 90 minutes, the length of the average sleep cycle. For example, if you go to bed at 10 p.m., set your alarm for 5:30 (a total of seven-and-a-half hours of sleep) instead of 6 or 6:30. You may feel more refreshed at 5:30 than with another 30 to 60 minutes of sleep because you’re getting up at the end of a sleep cycle when your body and brain are already close to wakefulness. not only feel better, but be more productive in your daily activities. You will also be healthier and happier. arise if you get TOO much sleep. Diabetes. Studies have shown that sleeping too long or not enough each night can increase the risk for diabetes. Obesity. Sleeping too much or too little could make you weigh too much, as well. One recent study showed that people who slept for nine or 10 hours every night were 21% more likely to become obese over a six-year period than were people who slept between seven and eight hours. This association between sleep and obesity remained the same even when food intake and exercise were taken into account. Headaches. For some people prone to headaches, sleeping longer than usual on a weekend or vacation can cause head pain. Researchers believe this is due to the effect oversleeping has on certain neurotransmitters in the brain, including serotonin. People who sleep too much during the day and disrupt their nighttime sleep may also find themselves suffering from headaches in the morning. Back pain. There was a time when doctors told people suffering from back pain to head straight to bed. But those days are long gone. You do need to curtail your regular exercise program when you are experiencing back pain. But doctors now realize the health benefits of maintaining a certain level of activity. And they recommend against sleeping more than usual, when possible. Depression. Although insomnia is more commonly linked to depression than oversleeping, roughly 15% of people with depression sleep too much. This may in turn make their depression worse. That's because regular sleep habits are important to the recovery process. Need another reason not to overdo the ZZZs when you're blue? ? In certain instances, sleep deprivation can have a temporary antidepressant effect. Heart disease. The Nurses' Health Study involved nearly 72,000 women. A careful analysis of the data from that study showed that women who slept nine to 11 hours per night were 38% more likely to have coronary heart disease than women who slept eight hours. Researchers have not yet identified a reason for the connection between oversleeping and heart disease. doctor's visit might be a good idea. Sorry, but I have had to reset my blog and add the word verification. Lately, I have had so much spam it isn't even funny. Anywhere from people telling me that I have the most wonderful blog in the world to people telling me I have thousands of misspelled words; neither of which is true. I hope this does not keep anyone from commenting. I love to hear what real people say. Granted, those word verification are a pain in the you know what, but at least I know it is not a computer commenting, lol.